Many of the readers have been questioning whether I am making all of this up and have asked to see photos of our house. I would, but wouldn’t want to give you a heart attack. Therefore I will give you a glimpse of the hello Kitty Hell I live in by showing you a few photos of our bathroom. As you can see, there are multiples of everything and so many that many of them can’t even be displayed facing forward. This, my friends, is how all the rooms look if not piled with more Hello Kitty stuff. I’m very tempted to just start taking pieces away one at a time, but if it is one thing I’ve learned about Hello Kitty fanatics, even if they have nine of an identical Hello Kitty items stored in a far corner of a room in a box on the bottom that hasn’t seen the light of day for 3 years, when they open it and see there are only 8 of the Hello Kitty, you receive the Hello Kitty Death Stare (which means a minimum of a week on the couch with the Hello Kitty sleeping bag). I love Hello Kitty too. I also love reading your blog. My obsession drives my fiance nuts as well, but he says that as long as it doesn’t get as bad as your wife’s, he will be fine with it. I really enjoy reading your articles, it gives me a chuckle. I would really like to see more pictures of your “HK House”!! You can’t even ___ in peace! That is hell! I am living in Japan right now, just moved here three weeks ago. I love Hello Kitty and my husband has your point of view. I would love to know where your wife is finding all of that stuff. I look everywhere I go but, from looking at the pictures, you guys are finding a lot more than I am! I, also, would love to see more pictures of your house! Ok, yikes! I am a Hello Kitty fanatic, but that is just way too much. I was expecting a Hello Kitty toilet seat cover, rug, shower curtain, etc… That looks like a store display. I’d love to see more pics of your house. OMG! I thought I was a Hello Kitty Fanatic, but your wife……My husband would die or burn down the house one if I was that obsessed. I would love to see more of your HK house. My prayers will be with you lol. I think that I have bought some things from your wife’s ebay store. I LOVE FOREST FAIRY! hello kitty fanatics = getting on my nerves as i view your awesome site. i randomly stumbled upon it, and my heart goes out to you…i’m so sorry!!! that is just wrong………on so many levels……maybe they’ll grow mouldy!! Wow . . . I mean, like shiz-nit. I kind of thought you were making it up. You must really love your wife? Oh my God. You POOR MAN. That is sick and wrong! That clutter and HK at that? Your wife is very lucky to have found a man who hasn’t gone insane by this point, honestly. Why on earth does she need twelve of the same thing? I like Hello Kitty, a LOT, but not THAT much. Good GOD! I see this as being just as unfair as when men deck out a house in sports stuff. Your wife’s HK collection is no different than an over zelous sports collection. Quite frankly, I think if you’ve got an HK toilet seat, you should forever be off the hook for leaving it up. Do get a Hello Kitty plunger! At least that you’ll enjoy using, specially if the plunging part is her face. Hello Kitty is cute, but I have my limits! I love hk but I would never torture my boyfriend like that. My boyfriend and I thank you for teaching be to be hk balanced. Oh My Holy God. I’ll admit that I own maybe half a dozen Hello Kitty items, only useful ones (chopsticks, a cup, a flask…) but each one of them was purchased with a certain amount of shame and self loathing. You need to claim your house back!!!! Jesus Christ, man. Start a fire, anything!!! Eric the new hello kitty fan!! … Even with this photographic proof I refuse to let myself fully believe people can become this obsessed. For my own peace of mind. Mate, seriously. You say yourself this is hell, although you must be used to it now. Have you actually tried to do something about this, like say “no more Hello Kitty products” for starters? Who’s the man in the relationship here? 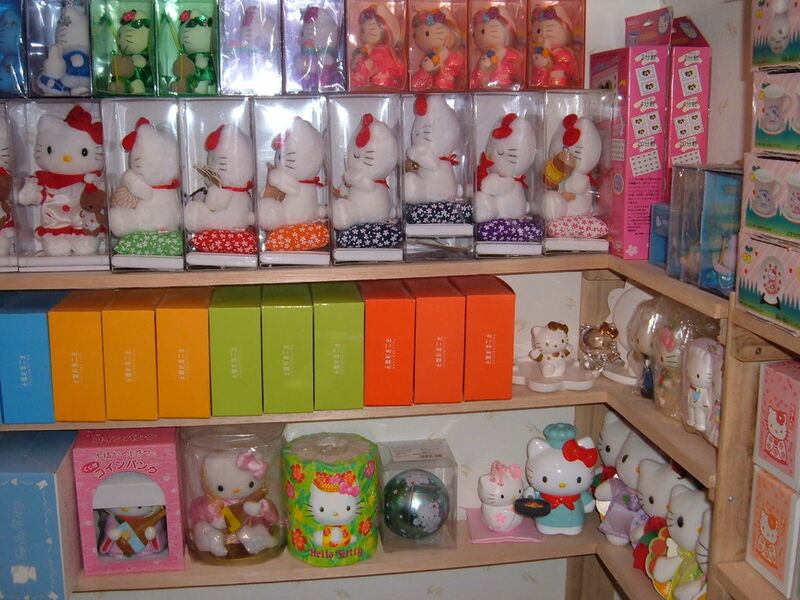 dayumm I thought I was bad 1. how does she afford all the HK stuff? and 2) why does she buy mulitples of the same exact thing (not the collection but the same items)? to sell? Wow there truley is hell in your home. I though i was going crazy having a hello kitty obsessed wife and daughter. But…wow this is much worse. i join the ranks of many and introduce myself as a Hello Kitty fanatic. i love your site and so does my husband. it actually seems like the two of you would get a long quite well and that he could add parts of his own! i’d love to see more photos of your wife’s collection-or maybe she has her own site for that? i’ll email you photos of mine sometime…ah, how i would love to live in Japan! does your wife collect other Asian pop culture characters besides HK? Wow, thank god im not that bad. I’m so happy I found HKH! I like HK, too, and I love reading a blog about her from a man’s viewpoint — very fun(ny)! I’ve read all of your past posts (jeez, who knew?!) and look forward to the HK marvels that you will find and share in the future!! I had to same problem and had to get rid of 75% eBay business, she need to get better storage or cut back the inventory. It’s amazing neither of you have gotten buried in an HK landslide. Oh my.. That’s YOUR bathroom? I thought it was some Hello Kitty store.. I love HK, but that would drive anyone insane.. I feel sorry for you, man. wow. that is a ridiculous amount of Hello Kitty. As a really-can’t-stand-HK reader, please accept my sympathy for the nature of your wife’s obsession. Might I respectfully suggest psychotherapy and/or a visit to your doctor for some appropriate medications? If not for her, then for your own sake…. My god, if I ever saw that much HK stuff all in one place I’d have to gouge my eyes out of my skull with a belt sander! Hi! I love your blog, but i can’t help noticing an error in your story… You made a post once about a toilet paper paradox where you had to choose between using hk tp or the other one…and you chose hk tp and you were found out by your wife b/c the tp was in the wrong choronilogical order, but in the picture the hello kitty toilet paper is standing alone on the shelf…? and it looks like a warehouse because of multiples of the same product, but PLEASE prove me wrong. thanks mr. hk man! I….I don’t get why she needs so many of the same kind of thing? When I first saw the picture I thought it was taken in a sanrio store…stuff isn’t even taken out of its original package…. but when you said you live in Japan, I understood everything. I’m guessing your wife is Japanese. I had a Japanese boyfriend for several years and I learned that they’re a little different from you and me. It’s a unique place, Japan. They’re a very weird people. I say that with no qualms, I like a lot of stuff about them, but they’re just outright weird. My ex used to tape hundreds of post cards to the walls in geometric patterns. And collect empty women’s perfume bottles. Damn. 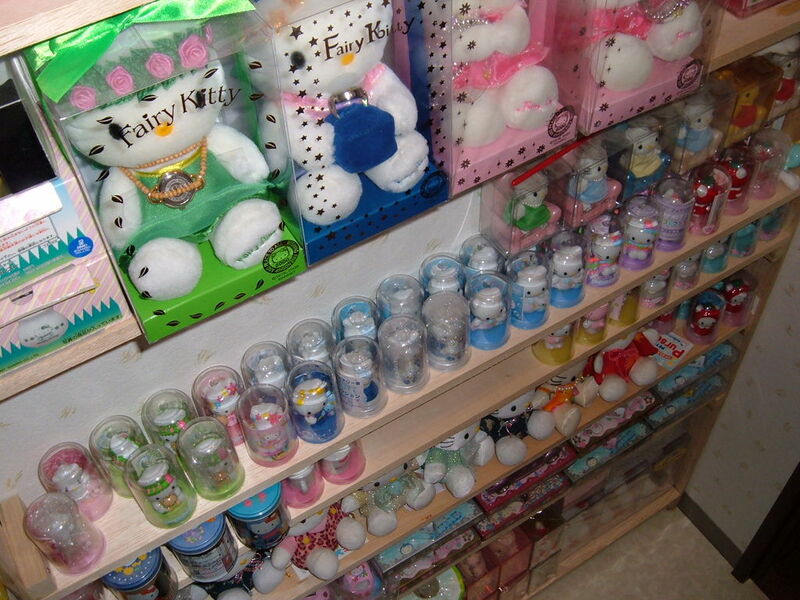 I can be in a Sanrio store for a few minutes — maybe half an hour if I’m having a particularly odd week — but despite the fact that I own a teeny bit of HK stuff and have some fond memories of the products … whoa. I do not think I could handle living in that. I’m glad that your money-making idea is actually generating money for you both and that your wife is doing something she’s good at and enjoys, but holy crap. 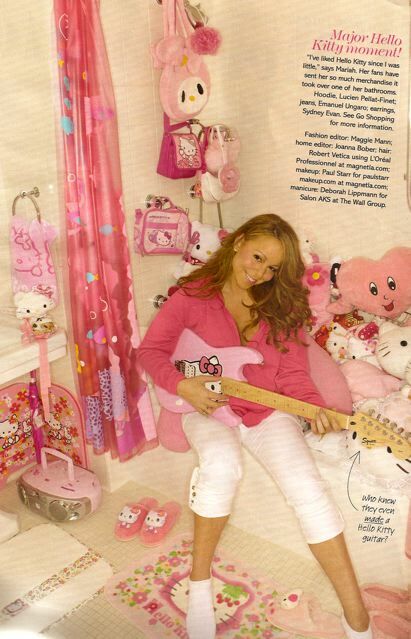 Actually _living_ in a Sanrio warehouse?!? gak. Once I wondered how much fun it would be to work at Sanrio USA, and I realize that even that would be heaven compared to your life … because at least I could escape at the end of the day if it became too much. You poor man. Have you heard of that psychological condition where people hoard stuff? holy mother of god that is the freakiest bathroom i’ve ever seen. i feel so sorry for you! when you go to the loo, do you close your eyes and imagine you’re in a NORMAL bathroom? i’ve never even thought of wishing for regular walls, but after seeing this, i’m thankful that my bathroom is normal. if your house is all like that, i’m really in awe that you’re not yet in the hello kitty mental hospital. wow that is one hell… have you ever thought of actually ____ on the dolls? Those things are evil Iz tellz ya…evil…EEEVIL!!!!!!!!!!!!!!!!! looks like the hello kitty fairy threw up. Past her stomach being empty. O_O”. Well, that is insane!! I mean, i consider myself a fanatic but that is plain overload. With that amount of kitty no wonder you are that pissed off. Seriously, as a fanatic family (my daughter, wife and me. Yes, me. Get used to it.) can buy many HK stuff but only one of it. Two, some of the times. Three when we all like that thing. Nothing more. But I agree with you sometimes when you say some things shouldn’t exist, like the weapons and toilet seats. I mean c’mon, keep HK dignified. Best wishes and keep up this blog. You even have to see her when you pee? Wow, that is awesome , but strange. I would feel weird to go potty in there. My Walter just kissed me and hugged me because I am not that bad, and I mainly like necklaces. You know, I love HK stuff. But that totally looks like an episode of Hoarders! That photo makes me feel clausterphobic just to look at it. You must love your wife VERY much to live in a house like that. I honestly don’t know if I could do it without snapping one day and just taking it all down to a childrens shelter and donating it. I mean really. and I’m a Hello Kitty Fan! My car is HK themed, and I have HK plushies [but I limited myself to TWO of them and that is IT], and a HK wallet, Nintendo DS, and camera case. But that amount of ANY theme is just way way too much.